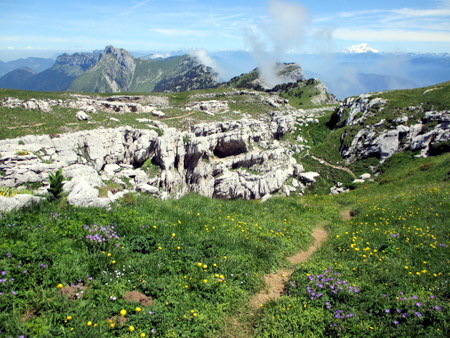 This walk provides a fairly tough round of the Dent de Crolles area, but it passes through some wonderful terrain, and is well worth the effort. It starts from the col du Coq, ascends to the summit of Dent de Crolles, and then follows the eastern crest to the col de Bellefont. It then returns to the col du Coq following a lower line (map). It takes its grading from a short, but rather slippery scramble, up the Cheminée du Paradis, but don't let it put you off if you're reasonably agile. Park at the top of the col du Coq (1434 m grid ref. UTM 31T 72238 50205), and follow a path through the woods towards the Dent de Crolles (it divides after a few metres - keep to the right). This take you onto the pastures beneath the impressive summit cliffs. These pastures are a riot of colour in the spring. Follow the track up to the col des Ayes (1538 m), reached some 20 minutes after leaving the car, and turn right following the zigzags up towards the cliffs. At a junction near the top of the pasture, take the path to the left, which traverses above some steep slopes. After a further ten minutes, you reach the Trou du Glaz, one of the entrances to the extensive Dent de Crolles cave system. A cold draught blows out of the interior, and ice will be found covering the floor quite late in the season. With a couple of lights, it is safe to venture through the entrance chambers for some 250 m until the draught emerges from a narrow, greasy ascending rift. Beyond are a sequence of shafts, so you should turn back here. Continue from the Trou du Glaz for a few metres, until some cables can be seen ascending the cliffs on the right. Climb these easily, and follow the path up a few chimneys and across ledges, rising up the cliffs through a line of weakness. This part of the route is fun, but easy, and you gain height rapidly. After another ten minutes, an obvious junction is encountered where the incline has eased. The path to the right is the Sangle de la Barrére, and is our selected way to the summit for the day. This sangle path follows a terrace between the upper cliffs of Dent de Crolles. At first, one is not really aware of the situation, but after 20 minutes, the terrace becomes narrower and steeper, the protective trees disappear, and the path becomes distinctly more airy and exciting. In spring, the bear's ear primrose may be seen growing out of nooks and crannies in the limestone cliffs. Eventually the path divides at a gully - take the upper path which soon leads to the top of the Pas de l'Œille fault gully, easily recognised from an isolated pinnacle in its centre. The summit (2062 m) is five minutes to the right, reached within a couple of hours of leaving the car. On a clear day, the views are spectacular. The Belledonne hills can be seen over the haze-filled Isère valley to the east, and 100 kilometres to the north-east, the white mass of Mont Blanc seems to be hovering in the sky. To the north, west, and south, the Chartreuse massif fills the near and far horizons. From the summit, head down the shallow valley to where a path takes off to the right just before the first shake holes. This crosses the pasture, and contours north below the crest. After half an hour or so, a path goes off to the left - this leads back towards the Trou du Glaz path. We carry straight on towards the impressive Cheminée du Paradis cliffs. These are soon reached near a low point on the crest, near a prominent pinnacle. The Cheminée is an impressive cleft, about 10 metres high, ten metres deep, and less than a metre wide, and it is climbed in three steps. There is no exposure, but the holds are a very polished, and a little awkward (Difficulty 3). At the top, the path ascends some easy rocks before leveling out. The next section keeps close to the crest, with impressive drops on both sides. Half an hour from the top of the Cheminée, the route down to St. Trouvet is marked by a sign post (1860 m), close to yet another rock pinnacle. From here, the path climbs steadily towards the Piton de Bellefont, and involves some mild scrambling. The summit is gained with a bit of a flourish, about an hour after leaving the Cheminée. This marks the end of the upland part of the walk. We now follow the path as it contours across towards the col de Bellefont. At the col, turn left to find the path that descends the pasture to the cabane de Bellefont in wide-sweeping zigzags. There is a water source near the cabane (1650 m) - the first since we left the car - so it's a useful place to stop and refill water bottles. We now follow the path (we are now back on the GR9) across the water source, through the pastures, and up into the Chaos of Bellefont - a well-named, complex area of shafts, pits, and caves. This is then left for another area of alpine meadow, which soon leads us to le Prayet - the start of a route down into the Perquelin valley. From here, the path contours flowery slopes, with impressive views down towards Perquelin, and then descends a couple grassy rakes which take us to the base of the Cheminée du Paradis cliffs about an hour after leaving the cabane. The next section takes a fairly convoluted route through the lapiaz, and up and down minor rocky outcrops, but it is reasonably well marked with the GR red and white paint flashes. A junction is reached after 20 minutes, with the path to the summit of the Dent de Crolles going straight on and our route down towards the Trou du Glaz heading off to the right. The descent down to the Trou du Glaz needs to be taken with care, as the limestone on the short scrambles is very polished, and very slippery - especially in wet weather. From the Trou du Glaz, it is simply a matter of reversing the ascent. It's only an hour between the summit plateau and the col du Coq, and the car is soon reached after a long, but satisfying day.